5 tone selective call (ZVEI,EIA,CCIR). 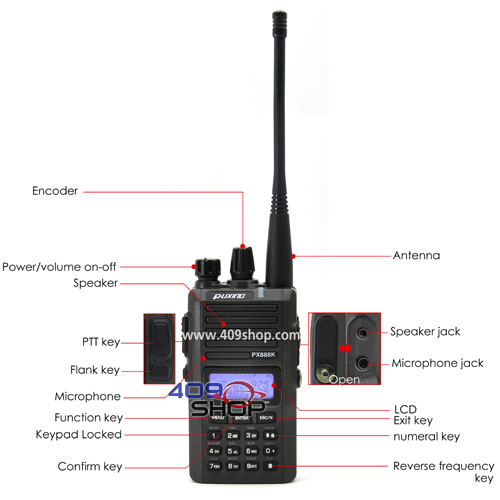 These tones are often used in professional environments, which makes this radio compatible with commonly used professional hand-helds. Scrambler, 8 groups. Although banned by law for for use by Ham radio operators, this can be a lot of fun and adds a basic level of privacy. The word ‘groups’ is presumably another word for the various frequencies which are commonly used used in voice inversion systems. The 409Shop has them for $80. Don't forget: you may want to pick up the PX-888K in bulk to get a free jacket or polo shirt!